Massive bilateral renomegaly with maintained renal morphology poses a diagnostic challenge due to its rare occurrence. A 9-month-old female child, previously asymptomatic, was admitted to the pediatrics department for fever and recurrent upper respiratory tract infection. 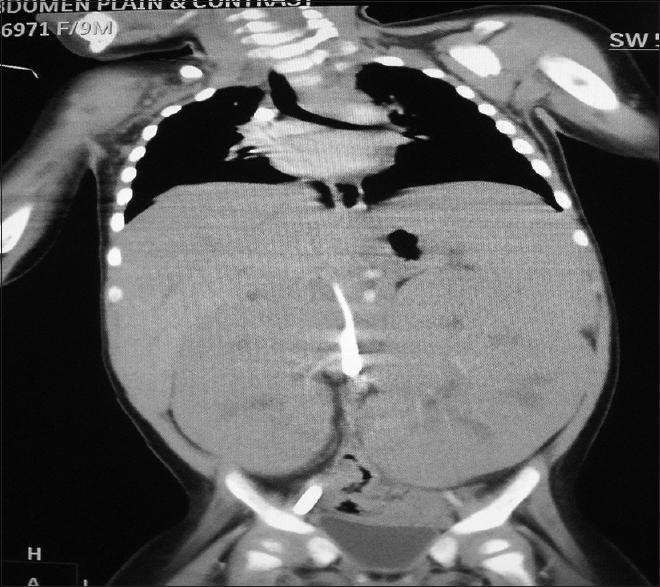 On clinical examination of abdomen, there was bilateral palpable renomegaly. Her serum creatinine was 0.7 mg/dl. Ultrasonography of abdomen showed massive smooth enlargement of both kidneys with mildly increased cortical echo pattern and hypoechoic medulla. 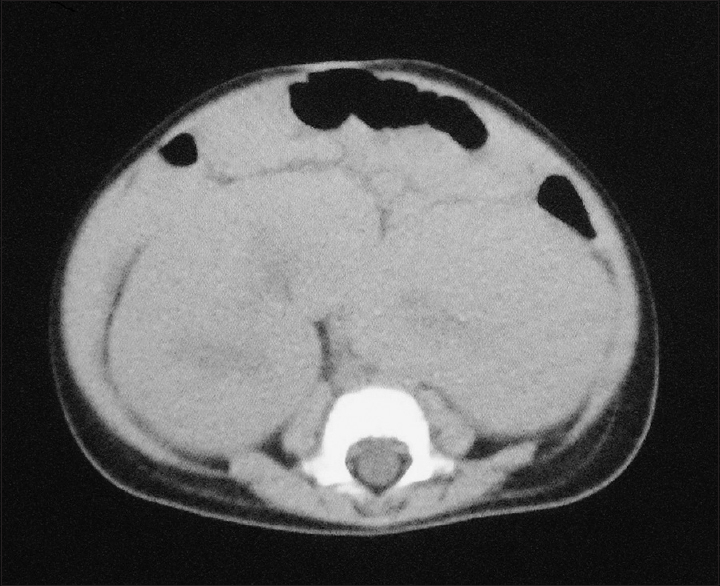 Computed tomography (CT) urogram revealed massive enlargement of both kidneys without any focal mass lesion, decreased contrast perfusion of kidneys, no dilation of pelvicalyceal system, and mild hepatosplenomegaly [Figure 1] and [Figure 2]. Peripheral blood smear was inconclusive, but bone marrow examination confirmed the diagnosis of acute lymphoblastic leukemia (ALL). The patient was referred to oncologist for further management. Massive bilateral renomegaly with maintained renal morphology in pediatric patients should be evaluated for underlying diseases including storage diseases and blood dyscrasias. Ali SH, Yacoub FM, Al-Matar E. Acute lymphoblastic leukemia presenting as bilateral renal enlargement in a child. Med Princ Pract 2008;17:504-6. Pradeep R, Madhumathi DS, Lakshmidevi V, Premalata CS, Appaji L, Patil SA, et al. Bilateral nephromegaly simulating wilms tumor: A rare initial manifestation of acute lymphoblastic leukemia. J Pediatr Hematol Oncol 2008;30:471-3. Basker M, Scott JX, Ross B, Kirubakaran C. Renal enlargement as primary presentation of acute lymphoblastic leukaemia. Indian J Cancer 2002;39:154-6.